Welcome to another Sunday 7… and if you’re here, reading this, I’m guessing you’re trying to dip out of the hideousness of the real world and possibly looking for a spot of escapism? So, aside from this reference, I’m not going to dwell on the dreadful news we all woke up to this morning, because like you – I’m looking for a bit of a distraction and escapism as well. 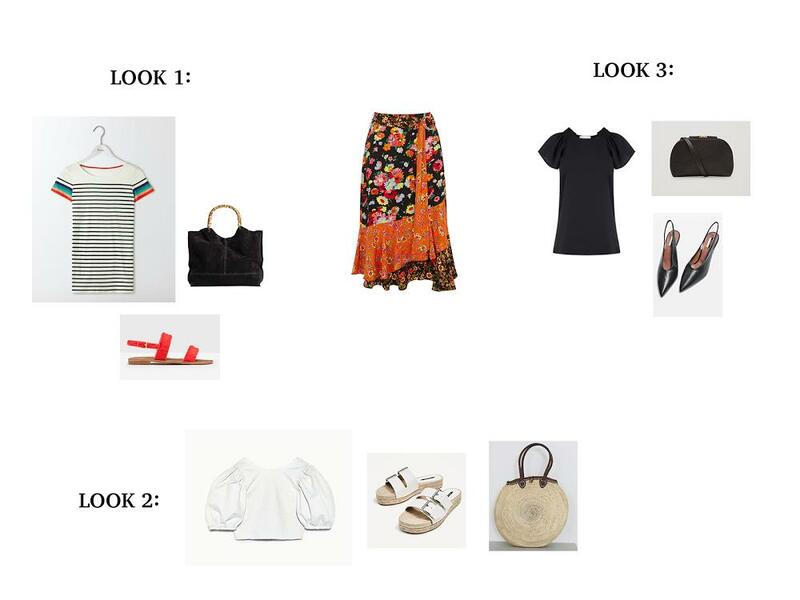 If you’ve been following my blog for a while now, you’ll know I’ve been on the hunt for *the* perfect summer dress… but as yet, the ‘right one’ has eluded me. 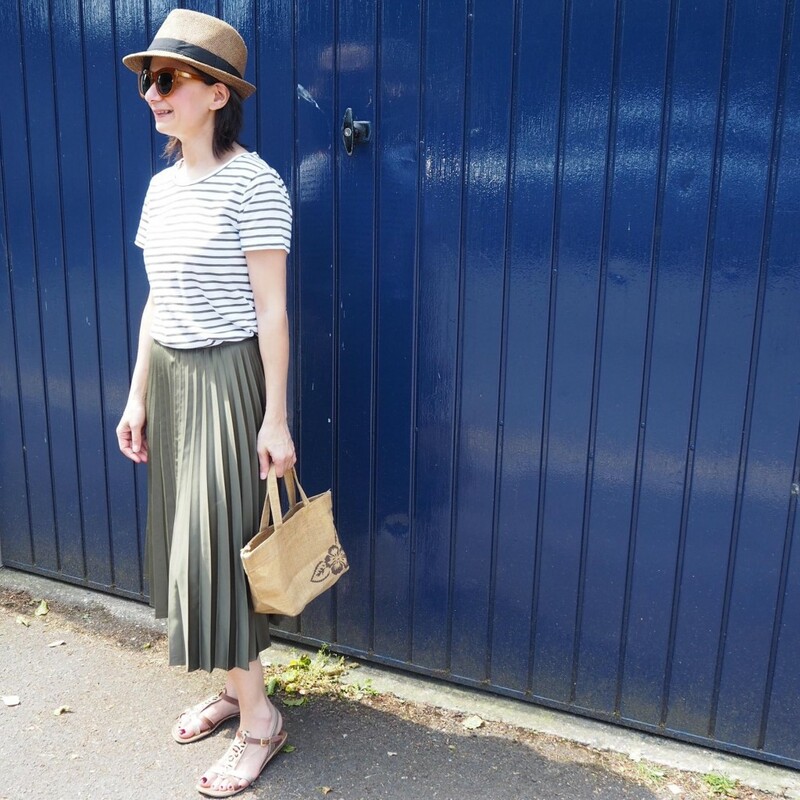 However, as the weather’s warmed up, I’ve found myself reaching for skirts more and more… which is most unlike me… but I think that having spent a good solid month in skirts and dresses whilst in Spain last summer, I discovered I really rather enjoy wearing them. Call it greed, call it being fickle… call it what you will: but I’d like to add another couple of skirts to my collection. 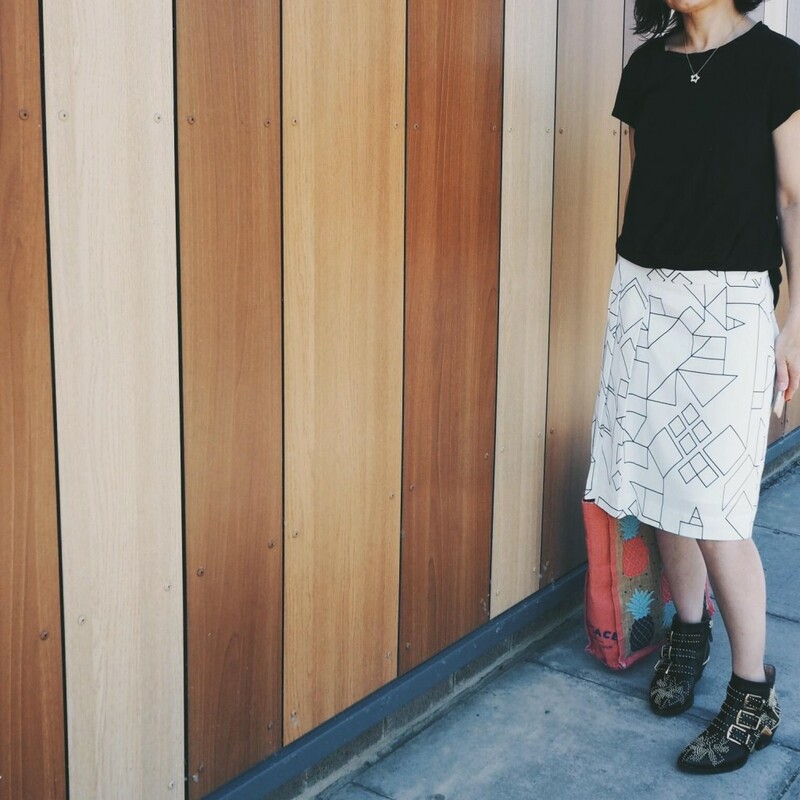 I posted a while back about the (now sold out) gingham version of this skirt after spotting on stylish Sue, and indeed, she’s spotted this striped version as well and featured it on her Friday Five this week… great minds and all that. I love this skirt on Sue, but being that couple of inches shorter than her… I’m just not sure if it would be too long on me? And I have to say, that this new version is striped rather than checked, is *even* more appealing: do I bite the bullet and try it? I think I’d wear it with sneakers mainly, just to dress it down. 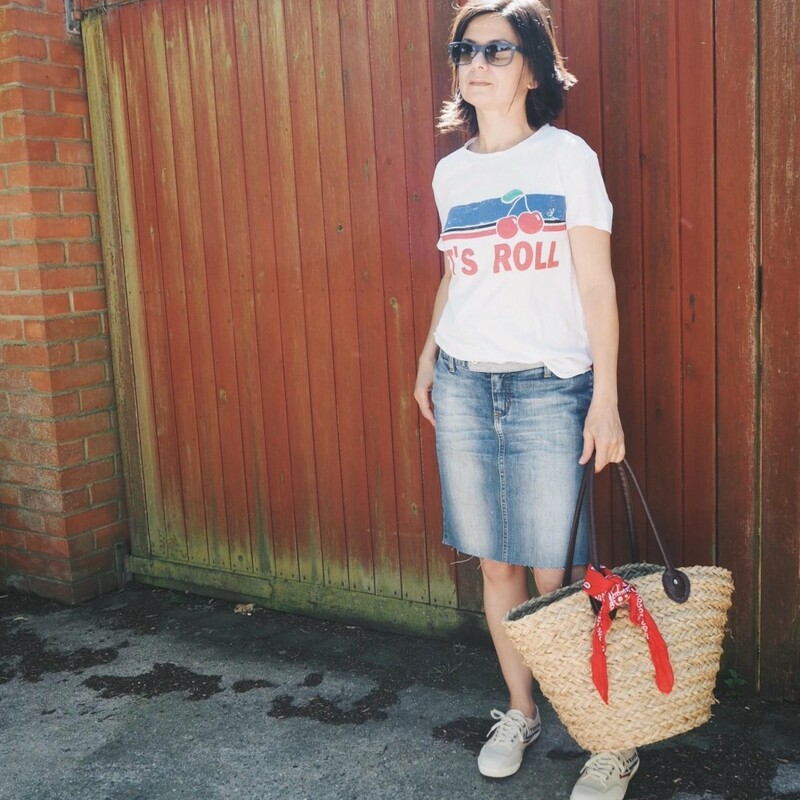 That said, it’s one of those skirts that I know I’d get what I call “small town looks” for wearing… as in, I might feel self-conscious doing my twee little village school run in it. I know I’ve said in the past that we should all wear what we want, regardless of where we live as long as we’re happy in our skin… but I will be the first to admit, there are some things I don’t mind getting a raised eyebrow for, and other clothing items which I probably won’t reach to wear if those eyebrows are raised: I reckon this skirt might be one of those things. And at the moment, £39 feels like a lot to spend on a faddy skirt. It’s in my basket though. I’m not gonna lie, I haven’t worn it every summer, but it has dipped in and out of favour… I’ve never charity bagged it though, because I know I fall in and out of love with wearing it. This pink denim mini is giving me all the summer holiday feels with it’s pretty pastel pinkness. And if I was younger, I’d probably still wear it in Autumn with opaques and a rollneck sweater but in reality, these days… I probably wouldn’t rock that look very well. Anyway, it’s a lovely little denim skirt, which would still be a good length for us petites… should you be in the market for a pink skirt?! No matter that *the* (supposed) colours for this year were Green and Blush pink… red still seems to be a firm summer favourite and is very much here to stay. I’m not usually that big on frills… but that’s mainly on tops/shirts etc… but this gorgeous tiered, frilly red skirt makes my inner flamenco dancer get her dancing shoes on… my old, creaky and stiff granny knees and dancing are of course, a match made in hell and more than likely, I would never, ever dance in this skirt. And indeed, this beauty is one for me to admire from afar because it would quite simply be a maxi length on me and swamp me. Looking at the tiers, I do believe the bottom half could be removed and shortened to bring the whole skirt up a little… I just haven’t got that kind of alteration in me. 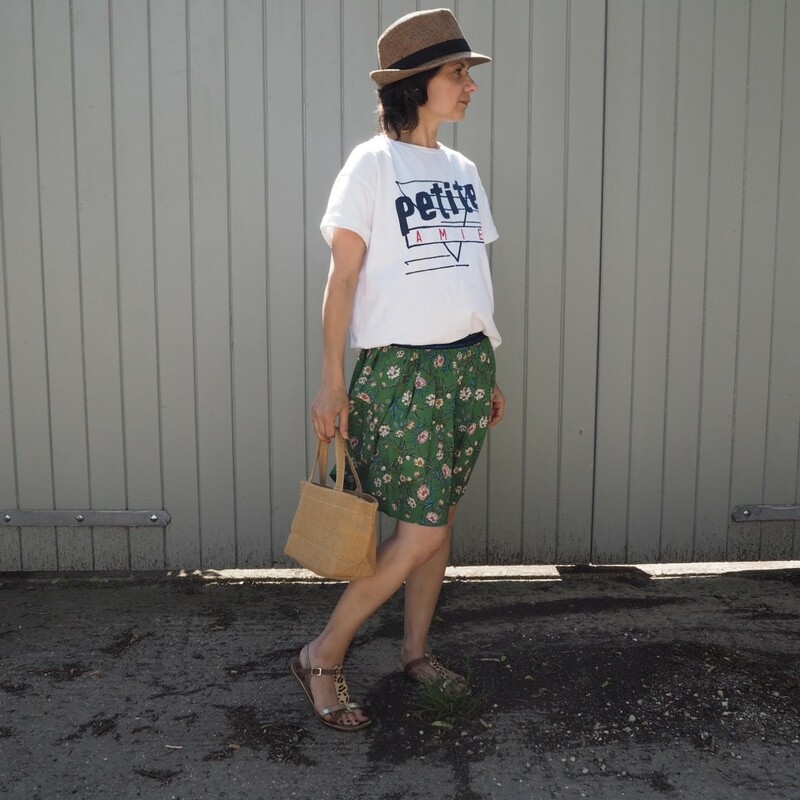 Spotted this fabulous cargo skirt with its fabulous paper bag tie-waist a while back on my gorgeous Insta-pal Tracey (complete with fab blog A Snapshot of Me) and have been hankering after it ever since. Tracey is a fellow petite (though of course, no one is as short as me – I trump everyone on that) so I’m guessing the length of this skirt is good for petites. 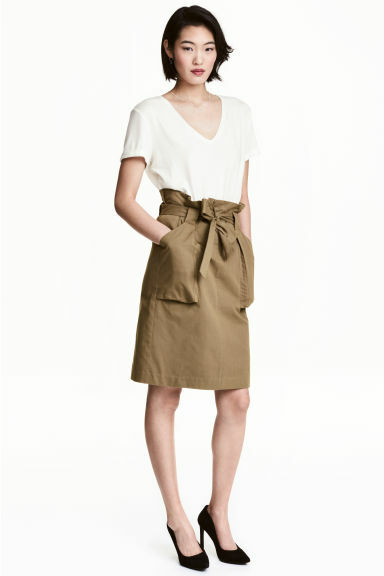 It’s a classic summer staple really, the cargo skirt… but that tie-waist just brings it up to date, and there are pockets people! We all love pockets, right?! 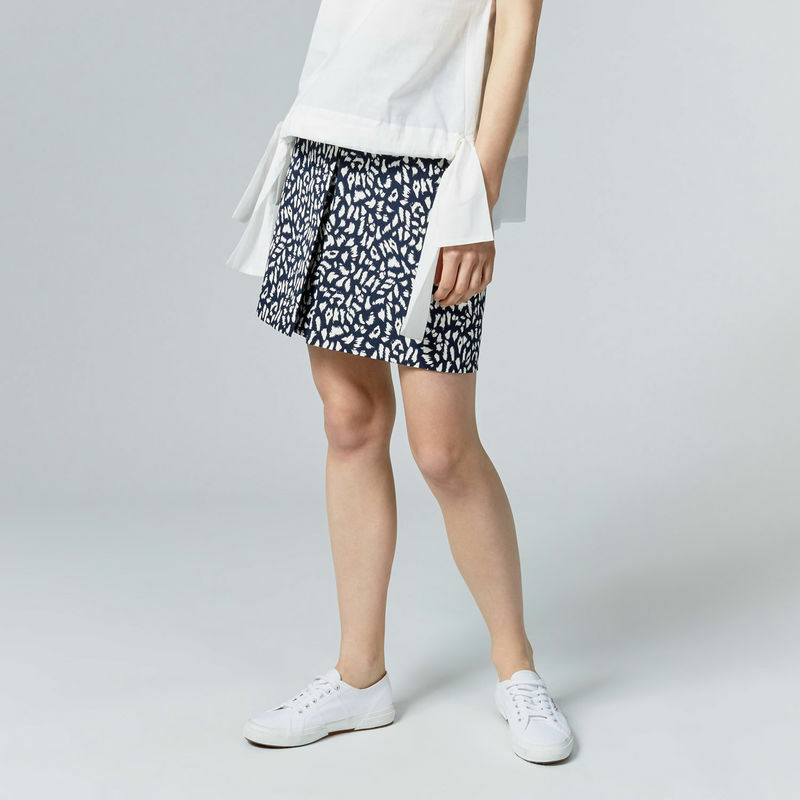 A white skirt is a classic wardrobe staple, and I am loving the a-line shape and hemline of this one. A lot. If you have an event coming up, this skirt would lend itself well to being dressed up… that said, although I wore my white wide leg crops a couple of days ago which survived both messy-play kids activities and a dog walk… I’m still always very nervous of wearing white clothing because I seem to be a magnet for spills and stains. And worse still, I seem to be totally unable to get rid of stains, vanish stick or not! Though would the pink has as much versatility? Possibly not, but it’s still a lovely skirt. 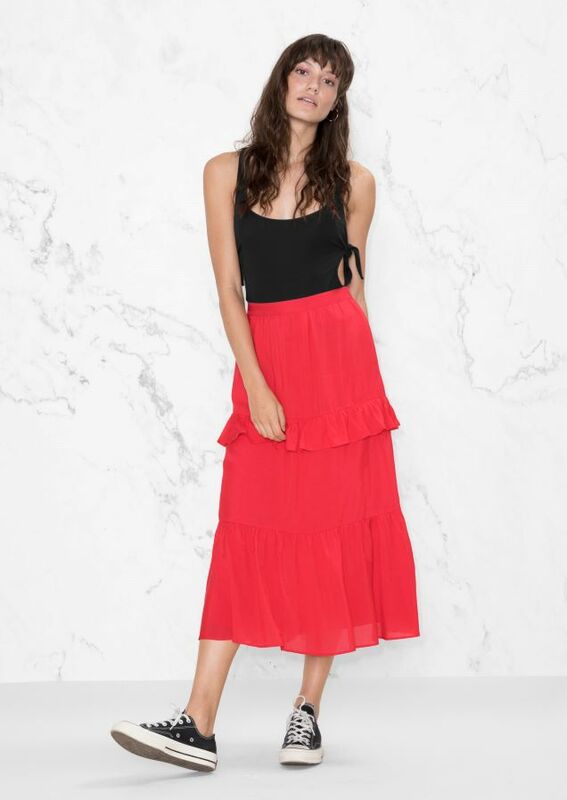 I think this skirt would look pretty smart with a white blouse and some wedged sandals or espadrilles, but as per the styling from the warehouse website, it looks great with a loose top over it and some plain white pumps. Again, the extra few inches of length on me would probably cut my leg off at the exact wrong point if I had a stylist looking at me wearing this skirt… but in my head, those extra few inches would be just great! Vertical and horizontal stripes mixed… a tie-buckle… love everything about this skirt. It would be too long on me, I would need to shorten it, but I reckon, if you have those all important 2 inches on me and are 5’2″ or taller… this skirt would look perfect on you! 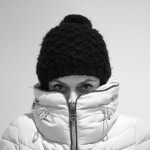 It’s very much in the here and now… and I just love it! And although I want it… I don’t think I have any alterations left in me at the moment; with some imminent house stuff on the horizon: redecorating, reflooring, remodelling of some rooms, re-doing the bathrooms in the weeks ahead, getting my sewing machine out on top of all that might just be pushing my luck. Basically, if you wanna go for one of these tulle-net/lace skirts… I think there are loads out there which are better than this one. I confess I haven’t seen it in the flesh and whilst there may well be some of you able to rock this one, I just know that if I wore this skirt, it would look like very much like I’d gone back in time to my early teens attempting to channel 80s Madonna or indeed, that I was simply in fancy dress. It’s a no for me. How about you? As someone who shies away from floral prints, this skirt is a floral print extravaganza and totally, totally outside of my comfort zone. To me, it’s pretty nuts, and yet, it’s kind of just *pretty* as well. Look 1 – Clash of the Prints: As there’s so much print in this skirt, you could go bonkers and wear some clashing Breton stripes with it! 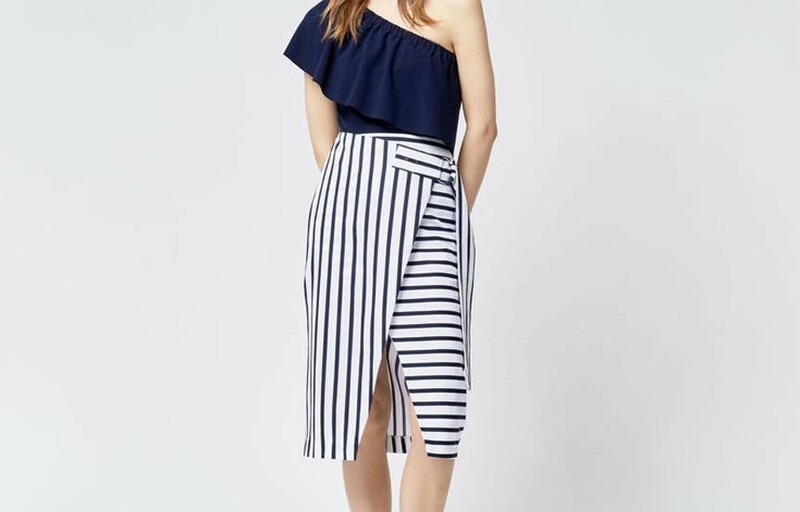 Something like this Boden Short Sleeved Breton (£22.50) with it’s rainbow sleeves, and these Boden Louisa Sandals (currently £63) in red which would pick out the red flowers from the skirt as well as the red stripe from the sleeve of the Breton? I’m not sure my small frame could carry all this print off, but I reckon some of you out there could! This plain HM (Premium) Suede Shopper (£79.99) would compliment the look perfectly. 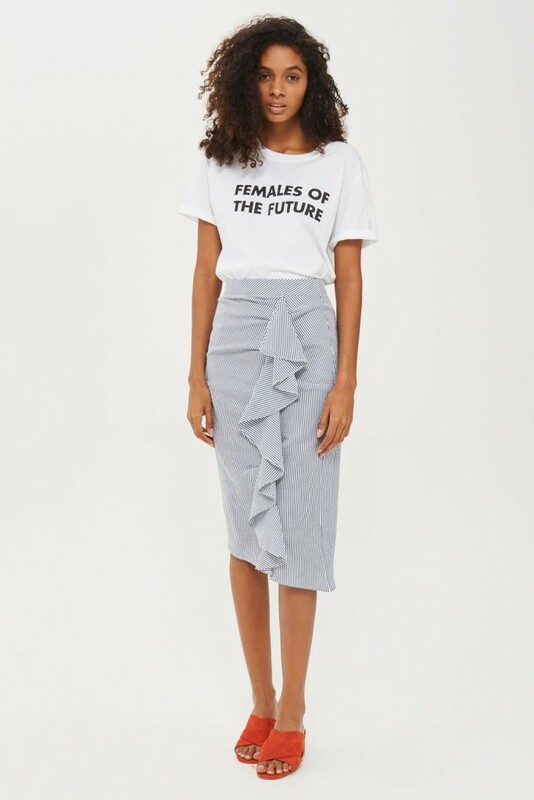 Look 2 – All the Trends: The skirt already has a frill, a tie buckle, and is floral… so how about teaming it with a big puffy sleeved top like this Zara Denim Top (£19.99) as well as some big-buckled sandals these Zara White Buckled Leather Slides (£29.99). A round basket bag (Etsy – £29.01 random price) would finish this look off. Look 3 – Day to Night: Similar to the look already featured on the Warehouse site, just teaming the skirt with all black: tucking this Warehouse Smock Detail Top (£26) and some Topshop Jemma Mid-heels (£59) plus a little clutch like this Cos Grained Shoulder Bag (£79 – the strap is removable so you can use the bag as a clutch). In terms of jackets, I’d probably go for the somewhat safe and predictable Denim or Leather Biker, although for Look 3, a shrunken black blazer would work too. And already at the end: what do you think? I have to say, the Wildcard this week is probably WAY too wild for me with far too much print: how about you? Would you wear the skirt? Apologies for postponing my mid-week blog earlier this week: it was half term, the sun was shining… and honestly… the boys were being so very lovely with one another, I couldn’t help but want to hang out with them messing about in parks, picknicking at the riverside and thoroughly enjoying their company, their laughter and just being their mum. That is, after all, what I sacrificed my employed working life for – to enjoy my kids. I know it’s not particularly professional in blogging terms, but I’m not exactly a career blogger earning an income from this… so, I figured you wouldn’t mind me taking a mini-blogging break, which was very much needed. And that underwear post I promised? It will get published – next week. Until then – stay safe my friends & thank you for reading. I wore my gingham ruffle skirt on the school run and one of the school mums said to me she had clocked it first thing that morning on me and loved it. You might be surprised. 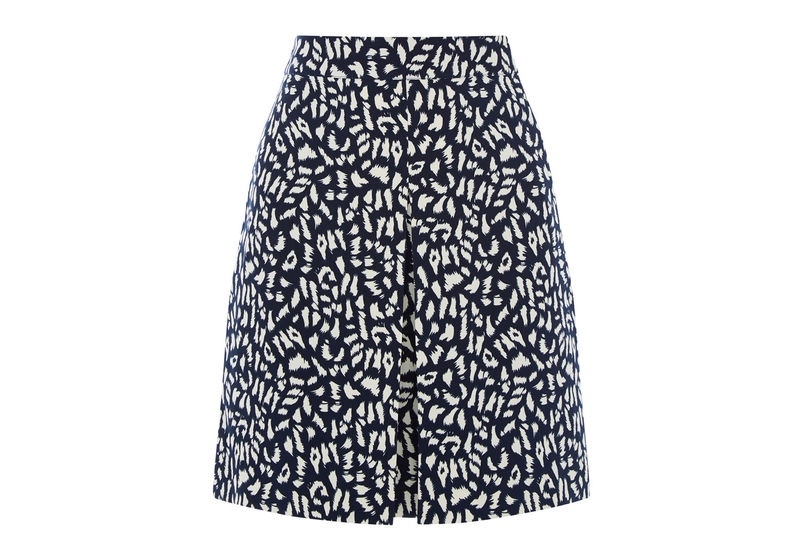 And if you can wear pink socks and trainers on the school run – you can do a skirt like this. Loving all your skirt looks – I might have to steal a few.